Bluetooth hands free calling is considered to be one of the most used technologies in cars because of the new Bluetooth law passed in California, New York, and Washington. The new law ban drivers from talking on their cell phones while driving. Well known car stereo manufacturers such as Kenwood, Pioneer, Dual, and Alpine began to integrate Bluetooth technology to allow making and receiving phone calls using the head unit. With these Bluetooth car stereo, external modules for Bluetooth connectivity aren’t needed anymore. You can also stream music from your cell phone or connect a Bluetooth adapter to your iPod and stream music from it through your head unit. You can do all that without connecting any wires or using transmitters. The AVIC F90BT is a newly introduced head unit with a built-in Bluetooth by Pioneer. This unit allows users to make hands-free calls with caller ID and call status displayed on the screen. What makes the AVIC F90BT unique is the built-in unique voice control technology which allows you to control what music you want to play and do hands-free dialing without pushing any buttons. Another great Bluetooth car stereo to look at is the JVC KD-ABT22. This unit features built-in Bluetooth connectivity that permits you to stream audio into the system and accept phone calls wirelessly. 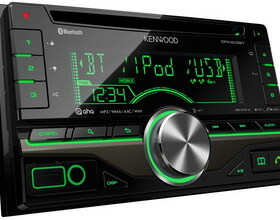 Car stereo systems are getting more complicated and offer more functions than simply play music. Since the Bluetooth law comes to effect, having Bluetooth in your car is considered to be one of the most valuable things.